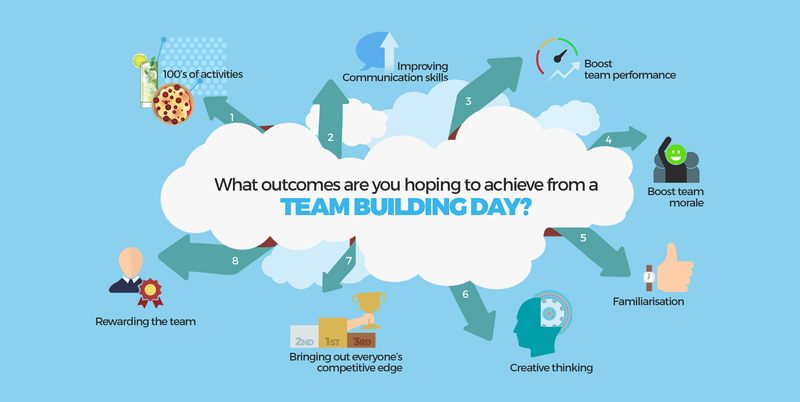 What Outcomes Are You Hoping to Achieve from Your Team Building Day? 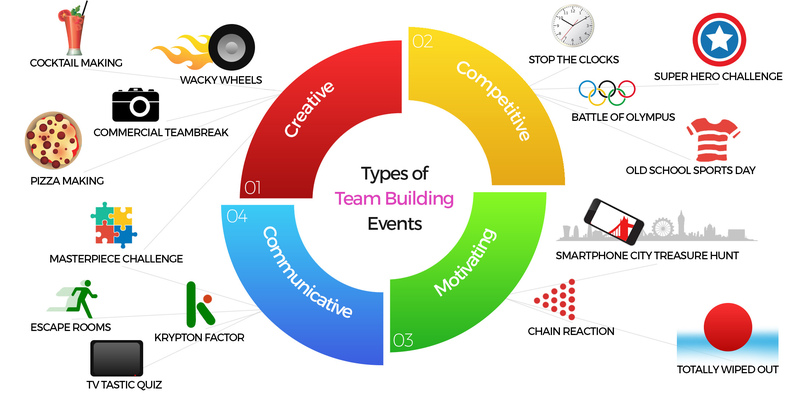 When you’re arranging a team building event, it is important to consider why you are arranging the event, and which activity is going to help best achieve your desired outcome from the event. There are hundreds of different team building activities and events available for you to book that will provide your team with a variety of different outcomes it all just depends on what is most important to you during your team building day. There are different activities to help achieve different objectives and give different outcomes. One outcome that can be achieved through team building events are improved communication skills. Helping colleagues to understand and listen to what others are saying is a big part of having good communication skills and good working relati­on­ships. You may also find that some of the quieter team members step up out of their comfort zones. With activities like the chain reaction or stop the clocks, each team member will quickly learn how important it is to communicate ideas and experiences between the group rather than staying quiet. Another outcome would be boosting team performance. Having an activity that would boost your team will automatically lift their spirits about working with the team and in work. This will then help them to become a lot more focused on their goals and deadlines within work improving productivity. Activities such as the krypton factor, crystal collection and challenge 100 will have your team work together more and ultimately change their attitude. Also if you have a group that loves a little bit of compe­titi­veness then you will find these activities will definitely help towards the way your team works together. Team building activities are also aimed for motivation and to boost the morale within your team especially if you have had a few months where everyone has been lacking motivation, deadlines haven’t been met or the business has hit a little dip. So by getting involved in activities it will take your team out of work and into a new situation where they can realise that working together to accomplish something can be fun! With the smartphone city treasure hunt, cocktail making and pizza making the sense of accom­plishment the team will feel from overcoming various obstacles will help bring the teams spirits up. Outcomes as simple as famili­ari­sation are also accomplished with team building activities if you have got a team that just needs a little bit of a confidence boost then it is good to put them in situations that will get the team involved with doing the same thing. You will find from the direct participation it will help them with the knowledge and skills that are required to work in a team. You will find this outcome is perfect for activities such as pizza making and mobile cocktail making. Creative thinking is often brought out more from team building activities. By putting your team into different situations you will find that they will brainstorm ideas more which will lead to them solving problems in a totally different way to how they usually would. Especially with activities like the masterpiece challenge and the commercial teambreak. With the help of these type of activities you will find that your team will learn how to use methods that will shift their mental state into a more creative thinking one. If you are after bringing out your team’s competitive side, then put them into a situation where some friendly competition is needed. This will improve everyone’s work ethic as they will all want to come out on top. Activities like battle of Olympus, old school sports day and the superhero challenge are great ways to do that. This can bring out the motivation within people and improve their overall performance in work. And sometimes the outcome you want from a team building activity is simply just to reward your team. If you have had a hard few months or you want to celebrate a success, then providing your team with some fun filled activities will be perfect. Whether that be with pub Olympics, cocktail making or smartphone pub treasure hunt.All of these activities are a great way to show that working together as a team can be fun and then you will see it implemented a lot more within their work.